It is possible to read a lot of scripture today. We know why. It is the story that matters and we need to be taken along by it. To get into it. This is the one Sunday of the year when we might well let the story speak for itself. The one Sunday when there is no sermon (though whether this is for time management reasons or for more spiritual ones is another matter). It might be, however, that a few well-chosen words help the story speak afresh. As soon as it was morning, the chief priests held a consultation with the elders and scribes and the whole council. They bound Jesus, led him away, and handed him over to Pilate. 2Pilate asked him, ‘Are you the King of the Jews?’ He answered him, ‘You say so.’ 3Then the chief priests accused him of many things. 4Pilate asked him again, ‘Have you no answer? See how many charges they bring against you.’ 5But Jesus made no further reply, so that Pilate was amazed. according to his custom. 9Then he answered them, ‘Do you want me to release for you the King of the Jews?’ 10For he realized that it was out of jealousy that the chief priests had handed him over. 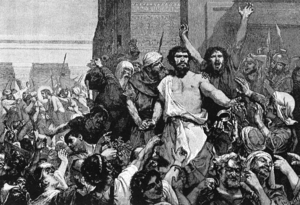 11But the chief priests stirred up the crowd to have him release Barabbas for them instead. 12Pilate spoke to them again, ‘Then what do you wish me to do with the man you call the King of the Jews?’ 13They shouted back, ‘Crucify him!’ 14Pilate asked them, ‘Why, what evil has he done?’ But they shouted all the more, ‘Crucify him!’ 15So Pilate, wishing to satisfy the crowd, released Barabbas for them; and after flogging Jesus, he handed him over to be crucified. gether the whole cohort. 17And they clothed him in a purple cloak; and after twisting some thorns into a crown, they put it on him. 18And they began saluting him, ‘Hail, King of the Jews!’ 19They struck his head with a reed, spat upon him, and knelt down in homage to him. 20After mocking him, they stripped him of the purple cloak and put his own clothes on him. Then they led him out to crucify him. 25 It was nine o’clock in the morning when they crucified him. 26The inscription of the charge against him read, ‘The King of the Jews.’ 27And with him they crucified two bandits, one on his right and one on his left. 29Those who passed by derided him, shaking their heads and saying, ‘Aha! You who would destroy the temple and build it in three days, 30save yourself, and come down from the cross!’ 31In the same way the chief priests, along with the scribes, were also mocking him among themselves and saying, ‘He saved others; he cannot save himself. 32Let the Messiah, the King of Israel, come down from the cross now, so that we may see and believe.’ Those who were crucified with him also taunted him. ‘Pilate was amazed’. v 5 John Pridmore in ‘The Word is Very Near You’ says that the word ‘amazed’ is a poor translation. ‘Pilate wondered’, is more like it. What for you is the difference between ‘amazement’ and ‘wonder’? Which experience takes you deeper? Humiliation. v 6-20 Mark does not use the word. He doesn’t need to. Jesus is second choice to Barabbas. He is routinely called ‘The King of the Jews’. He is clothed in purple. He is crowned with thorns. He is mocked. You know all this. But have you ever put yourself inside the experience and felt your dignity, your identity, your heart, just melt away? Someone in your congregation will know what this feels like. Who might that be? How will you help them on a healing journey through Holy Week? ‘those who were crucified with him also taunted him’. v32 They are adding their voices to the passers-by, chief priests and scribes. And so it continues. Relentlessly. Jesus is not only put to death he is driven out of any human company or companionship. What can you say about the loneliness of this? ‘the way in which he breathed his last’. v39 The way in which Jesus breathed his last was evidence enough for the Centurion. The whole meaning of the whole story is revealed in the last gasp. This is salutary. It is never too late to be so fully yourself that someone can see God through you. How do you hope to breathe your last? The theme of looking and seeing remains with us from last week. The passage starts with Greeks who want to ‘see Jesus’ and ends with a reference to the revelation of who he really is in his full glory: the man on the cross, lifted up for all to worship. Now among those who went up to worship at the festival were some Greeks. 21They came to Philip, who was from Bethsaida in Galilee, and said to him, ‘Sir, we wish to see Jesus.’ 22Philip went and told Andrew; then Andrew and Philip went and told Jesus. 23Jesus answered them, ‘The hour has come for the Son of Man to be glorified. 24Very truly, I tell you, unless a grain of wheat falls into the earth and dies, it remains just a single grain; but if it dies, it bears much fruit. 25Those who love their life lose it, and those who hate their life in this world will keep it for eternal life. 26Whoever serves me must follow me, and where I am, there will my servant be also. Whoever serves me, the Father will honour. 27 ‘Now my soul is troubled. And what should I say—“Father, save me from this hour”? No, it is for this reason that I have come to this hour. 28Father, glorify your name.’ Then a voice came from heaven, ‘I have glorified it, and I will glorify it again.’ 29The crowd standing there heard it and said that it was thunder. Others said, ‘An angel has spoken to him.’ 30Jesus answered, ‘This voice has come for your sake, not for mine. 31Now is the judgement of this world; now the ruler of this world will be driven out. 32And I, when I am lifted up from the earth, will draw all people to myself.’ 33He said this to indicate the kind of death he was to die. ‘went and told’.x2 v22 It seems very convoluted here, stilted. We can’t see what the problem is. Sure enough, the message gets through in the end. But it was not as straightforward as it seemed. Why did Philip need Andrew’s support? What if Andrew had not accompanied him? ‘if it dies it bears much fruit’. v25 This is the sort of phrase that sticks in the mind. literally. We don’t connect it up emotionally or practically. ‘Nice idea’, we think, ‘good comment’, ‘very true’. But we don’t trouble with the thought that maybe we need to do the grain of wheat thing ourselves. What is the grain of wheat that must die in your life or ministry? ‘now my soul is troubled’. v27 Notice the honesty. We know that Jesus knew and prayed the psalms. It comes through not in only in the direct quotations but also in the spirit of his praying: direct, open, raw, pithy, blunt. In a word, riveting. What would the intercessions on a Sunday morning be like be like if Jesus led them? ‘glorify’, ‘glorified’, ‘glorify’. v28 ‘I have’ and ‘I will’, says the voice from heaven. It is speaking of the past and the future. And yet the pressure here is on the present moment. The hour has come – now. There is some subtle stuff going on here regarding time. How do you see the past, present and future of glory fitting together? Jesus does not waste any time in Jerusalem. Nor does he pull his punches. There is violence here, in the whip of cords, in the action and in the words. Things are not looking good. People are getting hurt and it is going to get worse. But there is also fulfillment. The Passover of the Jews was near, and Jesus went up to Jerusalem. 14In the temple he found people selling cattle, sheep, and doves, and the money-changers seated at their tables. 15Making a whip of cords, he drove all of them out of the temple, both the sheep and the cattle. He also poured out the coins of the money-changers and overturned their tables. 16He told those who were selling the doves, ‘Take these things out of here! Stop making my Father’s house a market-place!’ 17His disciples remembered that it was written, ‘Zeal for your house will consume me.’ 18The Jews then said to him, ‘What sign can you show us for doing this?’ 19Jesus answered them, ‘Destroy this temple, and in three days I will raise it up.’ 20The Jews then said, ‘This temple has been under construction for forty-six years, and will you raise it up in three days?’ 21But he was speaking of the temple of his body. 22After he was raised from the dead, his disciples remembered that he had said this; and they believed the scripture and the word that Jesus had spoken. ‘Passover… Jews… Jerusalem’ v13. The point comes across powerfully through the rhetoric of this first sentence. What point, exactly? ‘the temple’ v14. If ever there was an iconic building, this was it. The centre of religion. The centre of power. The house of God. The place overflowing with the glory and presence of God. But look! It is differently full today. Sheep and cattle, doves and money-changers fill it up. The sight of it all, the chaos of it all, brought out the prophet in Jesus. What does it bring out in you? ‘what sign can you show us?’ v18 Good question. Jesus has attacked the ultimate sign. He has set about deconstructing the most powerful symbol ever created. He must have something pretty spectacular to replace it with. And yet, all he can come up with is his body. What sort of religion is this, that replaces a temple with a body? ‘his disciples remembered’ v22 We often forget that the gospels were written a long time after the event. The stories are so vivid, and the teaching so compelling, that we experience them as ‘live’. Notice here, however, that the believing comes not at the time but when they look back – through the lens of the resurrection. How does this passage come to life – or not – when you look at it from beyond the empty tomb?